Could it already be Thursday? My how this week has flown! And it's not just any 'ol Thursday - it's Dare To Be Sassy Thursday! This week's theme is June Bride. I was a May bride - I wanted to be an Autumn bride, but May is nice and our anniversary is a week before by darling daughter's birthday. We just celebrated our 21st anniversary! Isn't she lovely... isn't she - oh no! Now I have Stevie Wonder stuck in my head ugh! Anyway, make sure you check out the Sassy Studio Designs blog and check out the other gorgeous inspiration that awaits and create something of your own. Make sure to add your creation to the linkz at the bottom of the blog for your opportunity to WIN! Jodi, this is so lovely! So pretty Jodi. Love the soft pretty coloring and the lattice style background. Just stunning!Love the die. Thanks so much for joining us HobbyCutz. Beautiful card, it's all just stunning! What a beautiful and creative card design. Awesome. Thanks for your challenge entry at Scrap It Girl. Wow, this is so beautiful! Love your coloring! Thanks for joining us over at Scrap it Girl this month! She is lovely! I also wanted to be an autumn bride and was a May one! Just hit 20! I love the intricate die background. 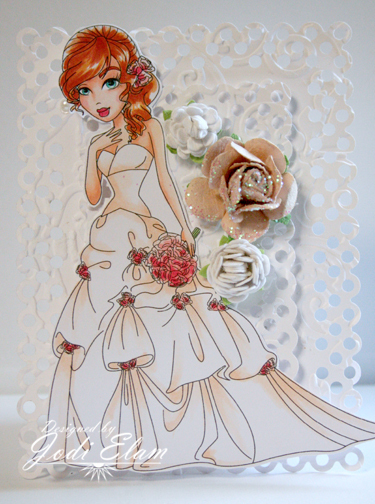 Thanks for taking the June Scrap It Girl Challenge! Gorgeous! Thanks for playing with the Scrap It Girls!